What are the causes of Somniphobia? What is Somniphobia? The Definition of Somniphobia: Somniphobia is an abnormal fear of sleep which is also referred to as Hypnophobia. A sleep disorder causing Sleep Deprivation. Like all phobias, the fear isn’t usually rational although it can be caused by Nightmares. The sole purpose of the article on a sleep disorder such as Somniphobia is to act as a reference guide to provide useful information regarding sleeping problems. It is not intended to be used to diagnose or treat Somniphobia or as a substitute for obtaining professional medical advice. Please remember that if you are in any doubt about your health please consult your medical practitioner immediately. 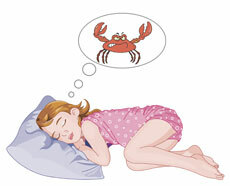 Fact 1: Nightmares are frightening or disturbing dreams that people have during REM sleep. Fact 2: Nightmares are different from night terrors, which are extreme panic attacks during non-REM sleep.